Usable in snowy and wet conditions with top handling capabilities. New generation computer program simulation analyses the pitch to create the best arrangement to effectively lower driving noise. The metal plate employs a completely new 3D design model which substantially enhances the tread block grip force. Also offers faster braking performance. 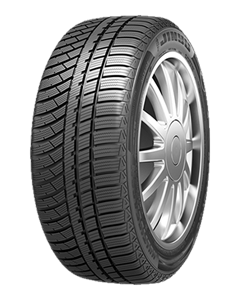 Uses all new asymmetrical tread design with three longitudinal main grooves which greatly improves tire handling performance and stability. The all season tire offers new features like the newly optimized profile design that allows for a comfortable ride all throughout the year.